Hello everybody! I am Gijs Reukers, 22 years old and student at Tilburg University since 2015. I study the bachelor business economics and want to start with my master’s in finance next year. I’m a member of TSC St. Olof and fraternity Les Sauvages. This year I will participate in the elections for the University council as number one on the list of student party SAM. I decided to run in the elections, because I perceived that over the last few years the university is getting more and more crowded. Long rows in front of the library, having to sit on the stairs in lectures and having a hard time finding a study spot at the campus have grown to be normal. I think this is bad for the development and motivation of the students and thus the quality of education. It is impossible to take notes when sitting on the stairs. Tilburg University has been proclaimed the best general university in the Netherlands the past few years and I don’t want the growth to obstruct these numbers. We’re all here to study, so I want diplomas to be as valuable as possible. To achieve this SAM has multiple ideas. For example: The teacher-student ratio should remain the same, so when the number of students grow the number of teachers should also grow; it should be unacceptable that lectures are given in overcrowded lecture rooms and there should be place for all students to study on campus. In short, if I am elected I want to facilitate the ambitions of every student together with SAM! Hi! My name is Kalliopi Argyraki and I’m number 2 on student party SAM’s candidate list. I’m 21 years old and finishing up the second year of my bachelor of philosophy here at Tilburg University. I think Tilburg university is a great university in many ways, but as with all things I think there’s room for improvement. As student representative I’ll strive to create a more healthy and welcoming environment for all students. Therefore, my main focus will be on student wellbeing and the housing issues of international students. A lot of students experience an overwhelming amount of pressure, leading to serious health issues. I personally believe there is a lot that could be done to minimize and prevent these issues through better guidance. For example, by increasing the amount of student psychologists and student advisors and by implementing a so called ‘buddy system’. Over the past few years, there has also been an increased influx of international students leading to a serious housing shortage. For a lot of international students it is simply impossible to find any housing at all. This is obviously an unacceptable situation. It is time to take some serious action and put our heads together to find a solution to this problem. It is important that every single student can feel at home in Tilburg. I believe inclusivity should be one of the main tenants of Tilburg University. As such I also think serious deliberation about the improvement of the integration of all students, with everyone’s well-being in mind, is long overdue. I want students to know that I will do everything in my power to make each and every vote count, and convert your ideas and concerns into actionable policies to help improve our university. Let us, all of us, work together and improve the quality of our university and come up with exciting new ideas for the future! Hello Everyone! My name is Janneke Hoenders, I am a 21-year-old Communication-&Information sciences student. This year I am proud to have the 3rd place on the list of Student Party SAM. I am a currently a member of TSV Plato and sorority ‘Mumtaz Dica’. In addition to this, I am also an active member of ‘Study Association Flow’ and ‘Serve the City Tilburg’. Lots of things going on, so why add another challenge to my plate? Well, as a student that seeks challenges both within and outside of my courses I actively want to contribute to fulfillment of every student’s ambitions by obtaining a seat in the university council. 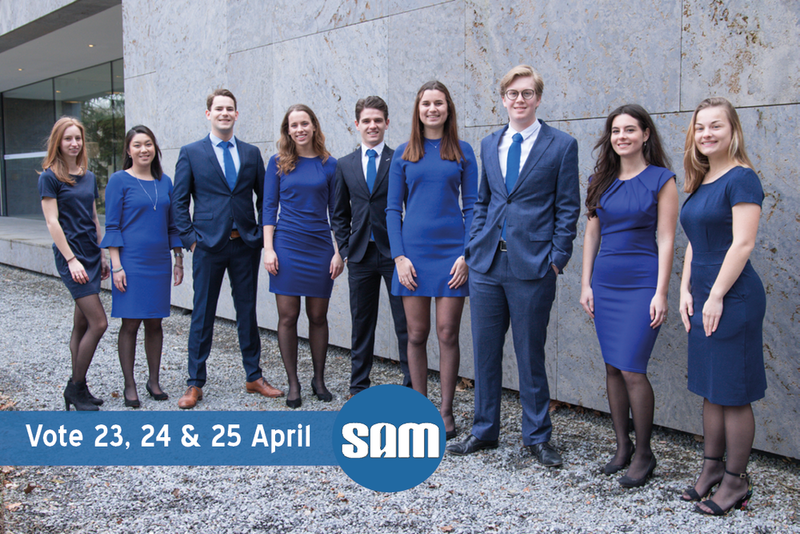 SAM prides itself in representing the ambitious students of Tilburg University. I believe that every student is unique in the way in which they express ambition. Some may strive to excel within their courses while others participate in (many) forms of extracurricular activities. All in all, I chose for SAM because we represent ALL students in the university council as appose to merely a small group of students. Aside from representing the needs and wants of my fellow students next year, I also want to focus on improving the quality of education at our university. More specifically, I want to improve the quality of our lecturers. Personally, I always notice that when a lecturer puts time and effort into their classes; I’m always more motivated to exceed. Creating and sustaining a moderating system for our lecturers will allow for the lectures to be worth going to and ultimately increase the value of your diploma. These are just a few examples as to why I want to run for the university council this year! If you ever have any questions, please don’t hesitate to come and ask me! Hi everyone, my name is Robin van der Beek and this year I want to do everything in my power to ensure that Tilburg University will be a better place for students. I’m 19 years old and I am currently in my second year of my study Economics and Business-Economics. Next to my studies I am a member of T.S.C Sint Olof and I am a board member of my fraternity Adat. Currently, I hold the fourth place on the list of student party SAM. I am really excited for the elections and to hopefully represent you in the University Council. I decided to join party SAM because I think it is a very interesting time for the University to make use of a lot of new opportunities and I would like to be a part of its developments. The world is becoming more and more digital. I want to ensure that the University uses all the new technical opportunities to the fullest. A great example of this is, offering short explanation video’s about difficult subjects to all students. We have all experienced it: part of a course is so difficult that nobody seems to understand it. If there were short videos about these subjects, some subjects would have been more comprehensive for me. Another example would be: a live Q&A with your professor a few days before the exam so you can enquire about all the problems you encounter while preparing for the respectable exam. Some professors are already testing these methods and most people is very positive about them and make great use of them. I want to ensure that these methods will become the status quo of Tilburg University. Thus, making it possible for every student to benefit of them. On behalf of SAM, I want to make sure that the University keeps on challenging itself to be innovative and to increase the Quality of Education. My name is Jody Esveldt, I'm 19 years old and number 5 on the list at Student Party SAM. I'm in my second year of my bachelor Dutch Law. I'm also currently the Vice-Chairman of Serve the City Tilburg, a volunteer organisation for students, and in the Campaign and Visibility Committee of Student Party SAM. Because I've been able to develop this year through my extracurricular activities, I want to ensure next year that all Tilburg University students will get the opportunity to fulfill their ambitions themselves. This can be both inside and outside of their curriculum. My main goal for next year is to connect the content of courses to the demands of the labor market, because studies are still very theoretical right now. Since everybody wants to prepare themselves for the labor market as much as possible, more practical experience within your study is necessary. Examples of how this could be implemented is a voucher system for soft skill training courses, so that students can practice their skills such as presenting. Elsewhere, faculties should organize guest lectures by alumni to show students what possibilities there are after graduation. Hi! My name is Sterre van den Berg, I’m 20 years of age and I’m currently in my second year of the bachelor Liberal Arts and Sciences while majoring in Law in International Context. Following my bachelor I would like to pursue a master in European Union law. In addition to my usual Liberal Arts and Sciences, I’m also taking some Global Law subjects, I am a part of the honours programme and I’m trying to master the German language. Outside of my studies, I’m the treasurer of Student party Dante, which is the part of Tilburg School of Humanities and Digital Sciences (TSHD) and I’m a referee for the highest field hockey division in the Netherlands. Due to the fact that our university just keeps on growing in number, I decided to stand up for the needs of students on an individual level. Especially, the way in which studies should prepare the student for his/her future. For example, I think that studies should be more connected with the labor market: there should also be support from the university to pursue an internship. Nevertheless, the university must not disregard its quality of education, if it implements such policies. In addition, I would like to help the students who play a sport. I believe that being able to sport, is of great value for student wellbeing. I also believe that it helps the relationship between students since you are always together with others if you sport. My board year at Dante has enhanced my interest in the politics of our university. Fractie Dante has given me the opportunity to do this on a local level. However, this year I want be active on an university wide level; thus I hope I can get elected for the university council! Hi everyone! My name is Mart Senden and I am a 22 year old student at Tilburg University. I am currently in the third year of my bachelor Communication and Information Sciences. Also, I am an active member of the study association FLOW and chairman of the Internal Committee from student party SAM. This year I was proudly announced as the number 7 on the candidate list of student party SAM for the board year 2019-2020. My goal for next year is to realize university wide support for extracurricular activities. As a result of the introduction of the new loaning system in the Netherlands, more students feel obliged to get their bachelor / master degree as fast as possible. This makes it difficult for students to get involved in extracurricular activities because students are afraid to combine university and extracurricular activities as it might cause study delay. Resultingly, this also negatively effects student well-being as students experience more stress than ever. Therefore, I want to step up for students and arrange university wide support for extracurricular activities. Getting the possibility to get involved in extracurricular provides opportunities to extend your personal network. Moreover, it adds value to your curriculum vitae as companies are looking for employees who have other experiences than just studying. On top of that it is excellent for your personal development which I hope to achieve as well during my board at student party SAM. Hello, my name is Anne-Mae Meulensteen and I’m 21 years old. I have been living in Tilburg for two years now and have enjoyed my time as a student a lot thus far. Currently, I’m in my third year of the bachelor Dutch law. I’m an active member of the student association Plato, where I’m an active member of the sorority DOT. This year, I have taken up the task of treasurer for my sorority. I enjoy being active alongside my studies. I believe being active in addition to studying, can help me develop myself as person and will also help me improve my academic results. This year, I’m the 8th candidate on the list of fractie SAM. I would like to obtain a seat for the council to be on the board of fractie SAM next year. I’m committed to create a more sustainable university. Sustainability is becoming increasingly important in our society and that is why I think the university should become more sustainable. For example energy, water, litter and mobility. I believe the university not only has an important task as a helping students obtain academic results but also as a role model for students, especially with regard to sustainability. Our university should play a great exemplary role in relation to social issues such as sustainability and environmental improvements. I think the university can work more sustainability and should communicate these developments better to the students. This should result in a sustainable campus, which makes great use of renewables. My name is Anne-Lin Heyne and I am 19 years old. I am a first year student at Tilburg University. Currently I am studying Dutch Law at Tilburg Law School. Before I started Dutch Law in Tilburg, I got my propaedeutics in Nijmegen. The difference in learning methods and student facilities motivated me to get involved with student party SAM. I also wanted to develop my own skills and extend my personal network by challenging myself outside my study. That is the reason I am running for this years elections. I am proud to announce that I am number 9 on the candidate list of student party SAM! What I want to achieve next year is to implement more innovative teaching methods at every faculty. Innovative teaching methods will stimulate students to participate and discuss in class. They will also give students the opportunity to develop themselves. Not every faculty can be as innovative, some studies are more theoretical, but innovative teaching doesn’t have to be difficult to imply. Every faculty has its own unique perspective. That is the reason that innovative teaching methods cannot be the same at every faculty. If the university wants to apply new teaching, quality of education has to be taken in regard and has to be as up-to-date as possible. Professions are changing and students need different skills and knowledge. The university must adjust to this changes. A Bachelor and Master have to connect to its practice. I hope I can achieve my goal to improve the quality of education during a board year at student party SAM!